I attended the Sweets & Snacks Expo (aka, The Candy Show) which was held May 23-25 at Chicago’s McCormick Place. The trade show organized by the National Confectioners Association hosted over 800 exhibitors representing candy, chocolate, and snacks companies. In this article, I will talk about chickpeas and lentils (pulses) in the snack aisle. I previously wrote about the “Coffee Meets Chocolate” trend at the show. If year 2016 was the International Year of Pulses as proclaimed by the United Nations, could 2017 turn out to be the year of pulse-based snacks? Numerous exhibitors spotlighted the use of chickpeas, lentils, dry beans, and other pulsesin snacks to promote themselves as healthier options to traditional chips. Using pulses allows snack companies to offer the nutritional benefits of being high in protein and fiber while being naturally gluten-free. Chickpeas, best known for its use in hummus, are likely to be the biggest star among pulses in snacks. Green Park Brands, the makers of HIPPEAS organic chickpea puffs, announced on May 23 that Academy Award-winning actor Leonardo DiCaprio and Strand Equity Partners were new investors in the company. HIPPEAS are certified gluten-free, kosher, vegan, and USDA certified organic. 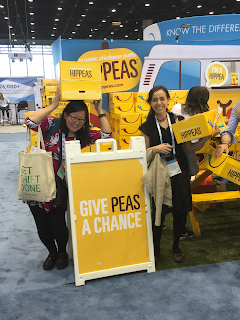 HIPPEAS are aimed at health and socially conscious millennials with bright packaging, the call-outs of 3g of fiber and 4g of protein per 1oz serving, and its partnership with Farm Africa, where a portion of proceeds go to supporting chickpea farmers in eastern Africa economically. HIPPEAS also made an appearance at the 2017 National Restaurant Association Show as shown in the photo above. Numerous other companies featured chickpeas, best known in the U.S. for its use in hummus. Rare Fare Foods, offered Off the Eaten Path Hummus Crisps made with chickpeas and rice flour. GLK Foods introduced GoBitos, a line of seasoned roasted chickpeas, as a high fiber, high protein, “satisfying meal replacement”. Saffron Road’s Saffron Road ChickBean Crisps offered 5g of protein per 1oz serving in addition to being certified gluten-free and Halal. The Saffron Road ChickBean Crisps are made with chickpeas, lentils, yellow and green split peas, and rice and sweet potato flours. In addition to chickpeas, lentils were another popular pulse at the show. Enjoy Life Foods, a division of Mondelez International, offered its Plentils lentil chips that are marketed as having 40% less fat than the leading potato chip, certified gluten-free, free of the eight major food allergens, and vegan. By combining lentils with high-protein edamame (immature soybeans), Harvested For You Baked Multi-Grain Chips by Hello Delicious! Brands offers 4g of protein per 1oz serving. The package for Daily Crave Spicy Sriracha Lentil Crisps from Natural Intentions, Inc touts its 3g of protein, vegan, kosher, and non GMO among its features.